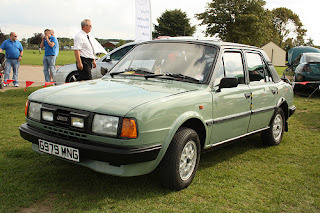 The Škoda 130/135/136 are three variations of a rear-engined, rear-wheel drive family car that was produced by Czechoslovakian car manufacturer AZNP in Mladá Boleslav between 1984 and 1990. Škoda 130 is known internally as Type 742, Škoda 135/136 as Type 746. 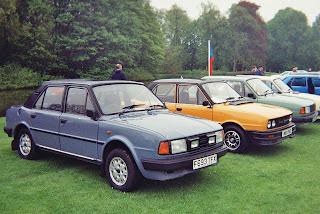 They were developed from the Škoda 105/120 series. 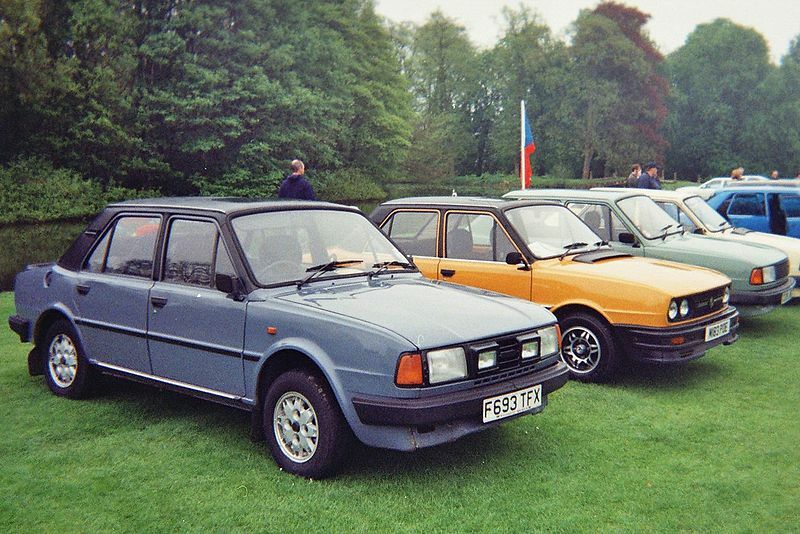 The very first Škoda 130 models were introduced in August 1984, shortly after the earlier Škoda 105/120 models were given a mild revamp. Developed from the earlier Škoda 105/120 models (some of which continued in production alongside the Škoda 130 models), the 130 series used a new 1289 cc engine (which produced 58 PS (43 kW), and which was just an enlarged version of the 1174 cc engine used in the 120 series). The 130/135/136 series also had a five-speed gearbox, semi-trailing arm rear suspension, wider track and four-pot front brake disc calipers (the latter two of which were already in use in the 105/120 series). The Saloon versions of the new 130 series were available in 130 Land 130 GL forms and the Coupè model was the 130 Rapid, which (with the exception of their mechanical specification) were broadly identical to the smaller-engined 120 LS and GLS Saloons and 120 Rapid Coupè. The introduction of the more technically innovated Škoda 130 series might have been a reasonably great success for Škoda, but the basic engineering design dated back to the 1960s, and was therefore extremely outdated by the 1980s. The final models to evolve from the rear-engined Škoda generation were the Škoda 135/136 series, introduced in 1987. The new models (which were available in exactly the same model forms as the earlier 130 series) had an uprated 1289 cm3 engine with an eight-port aluminum cylinder head (this was the same engine that was also used in the Škoda Favorit) and a higher output of 62 PS (46 kW), as well as a new front grille, also fitted to the remaining models of the 105/120 series. Inside, the only change was a new instrument panel. The 136 series was joined by the 135 series in 1988, which was available in the same model variations as the 130 and 136 series. The 135 was effectively a 136 with a lower compression ratio and lower engine power output of 58 PS (43 kW). The Rapid coupe versions of the 130, 135 and 136 series were renowned as being the only cars which handled like the notoriously enjoyable yet temperamental Porsche 911 of the same era. The rear-engined Škodas continued in production until 1990, when the very last ones left the Škoda factories in Kvasiny and Mladá Boleslav. The 1.3 Skoda Estelle was an unlikely hero of the Rallying world in the '70s and '80s. The Škoda Motorsport works team won their class a staggering 17 years in a row on the RAC (Around Britain) Rally. John Haugland was the inspirational Norwegian rally driver responsible for Škoda's success. The 130 models made their UK debut in March 1985 and were available in both Estelle 130 L and 130 LSE 4-door saloon and 130 Rapid 2-door Coupè forms, with an aftermarket Cabriolet version of the Rapid also available. The Estelle 130 GL, which was available in Eastern Europe since 1984, did not arrive in the UK market until May 1987. The UK market got the 136 Rapid Coupè and Cabriolet models in August 1988, followed by the rare fuel-injected Rapid 135 RiC Coupè in December 1989. Both these, and the Estelle 120 L and 120 L Five Saloons, were discontinued just four months later. The Estelle and Rapid were very competitive cars, which helped Skoda to new sales records in Western Europe in the late 1980s (about 17,000 105/120/130 models were sold in the UK in 1987 alone). 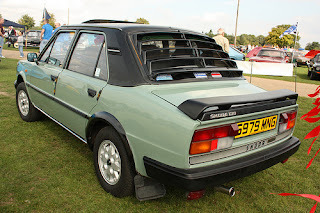 The new 130 models silenced the earlier criticism that had been made in some quarters of tail-happy handling, with the prominent UK motoring magazine "Autocar and Motor" remarking in 1988 that the new 136 Rapid model "handles like a Porsche 911" in that the rear-engine design encouraged oversteer. Like the smaller-engined Skoda 105/120, the Škoda 130/135/136 gradually became a rare sight on Britain's roads by the time the 21st century dawned. With just 612 of the Skoda 105/120 range still registered in the UK, it is unclear how many of the Škoda 130 series have survived. Due to their rarity in the UK, prices for good 130s are rising. 130 LSE (1984–1988) - Same as the 120 LSE only this time developed from the 130 L.
Rapid Cabriolet (1984–1990) - Developed from the Rapid Coupe at Ludgate Design Developments in Kent initially in Standard form only, which included a removable full-sized hood and a central rollover T-bar. The rarer Lux model available from 1987 had wind down rear quarter lights. At least 334 cabriolets were sold in Britain. 130 LX - this model was available in Finland (fitting in between the 130 L and 130 GL), with Saab seats fitted by the importer. 135 GLi - this fuel-injected four-door saloon model was available in Austria, Canada and Finland and was technically similar to the rare Rapid 135 RiC that was offered in Britain and Austria. 130 L - this model had all specifications (including the dashboard) of the 130 GL. All engines were 1298 cc OHV 8V I4 with aluminium block. Main difference between engines was cylinder head: 130 had 5-port cast-iron cylinder head, which couldn't use unleaded gasoline. 135 engines had aluminium 8-port cylinder head, which could use unleaded gasoline, for better performance and lower emissions. 136 engine is same as 135 but with bigger compression ratio for better performance. Uprated 135/136 engines were later used in Škoda Favorit and Felicia with last reincarnation as 1.0MPI and 1.4MPI engines in Škoda Fabia. Last updated on 10 May 2013 at 10:05.